Why does it feel like the moment my husband leaves for a training or deployment I completely forget how to cook? On a normal week, I cook for my family of 6 almost every day. It’s just cheaper for us to cook at home than to order take-out. I’m very good about looking up healthy recipes, making a weekly grocery list, and spending an hour in the kitchen every night. But it feels like the moment he walks out the door, all those cooking habits go out the window. Maybe it’s because I’m suddenly outnumbered by kids who are more interested in mac and cheese than thai chicken soup. Or it’s possible that after a day of taking care of those four kids by myself, I don’t have the energy to spend time in the kitchen whipping up another homemade meal. There’s also a complete lack of satisfaction in trying new meals without my husband there to taste, approve, and compliment the dishes. Whatever the reason, I’ve learned that almost everyone struggles with the cooking situation when their service member is away. 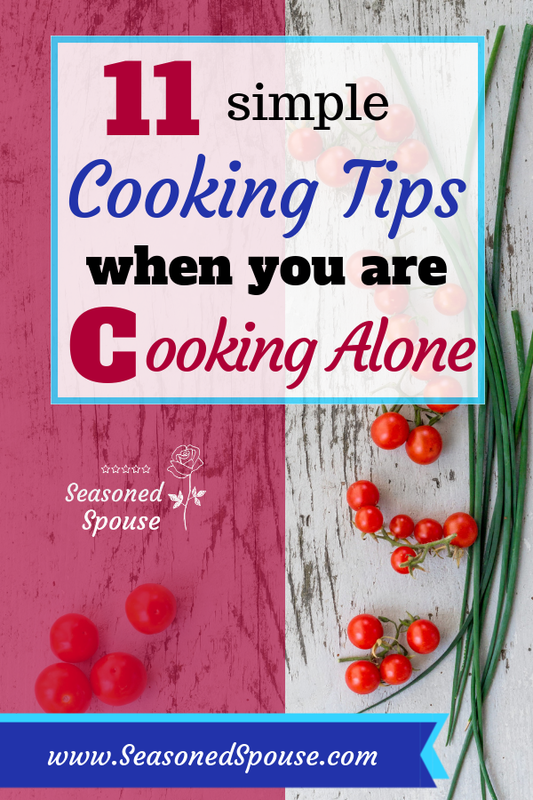 Whether you are now cooking for one, cooking for kids, or just struggling to find the time and energy to cook during deployment, I hear you– it’s a struggle! I get questions often about suggestions and ideas to make cooking easier during deployment. That’s why we included a video training of simple meals in the Deployment Masterclass. It includes three recipes that are easy to throw together, but healthy enough to be go-to staples throughout the deployment. The training includes printouts of the recipes and even a downloadable shopping list to make everything easier! You can learn more about the Deployment Masterclass here. If you’re looking for some sanity-saving tips to help you get your cooking habits back on track while your service member is away, then keep reading! I will share ideas for handling cooking for one, saving time and energy, and cooking with kids. I prepare for deployment the same way I prepare for having a new baby. (Maybe because for 2 deployments I did have a new baby!) You want to streamline your life and makes things easier on yourself. One of the best gifts to give yourself is a go-to list of simple, easy meals. Cook your favorite soup, casserole, or any dish that freezes well. Then freeze the leftovers in individual portions that you can reheat any time. This will be cheaper and healthier than living off the grocery store freezer section. Make a list of your simple favorites that you can throw together anytime. 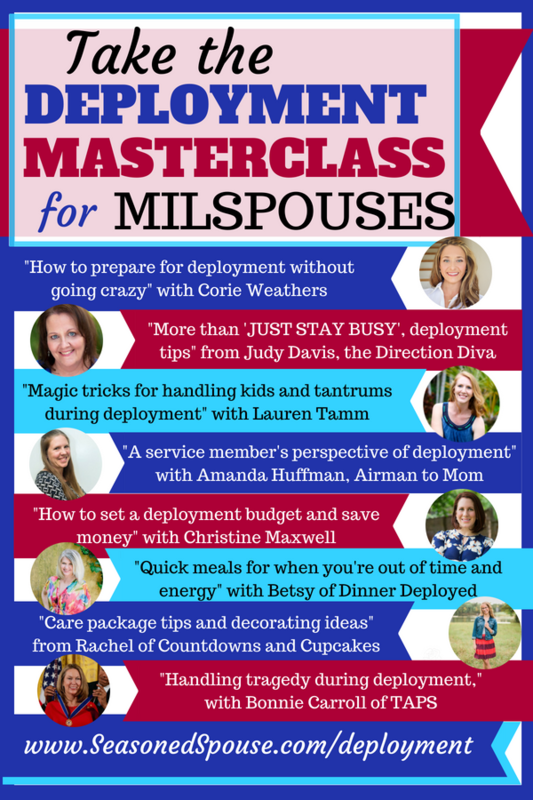 (Use the recipes in the Deployment Masterclass for inspiration!) Keep it on your fridge so you know you always have an option besides ice cream and wine for dinner. Try doing meal prep on the weekend, or your day off, so you will already have some meals packed and easy to grab throughout the week. 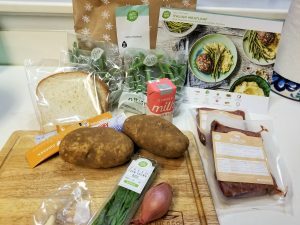 Try a meal delivery service like Hello Fresh so you’ll get fresh recipes and ingredients delivered to your door. You can read my review of three different meal companies here. Plan your weekly grocery list. Write down your meals in advance, and check the ingredients you have on hand. Not only will this help you streamline your time in the grocery store, but it will also prevent you from making multiple visits to the store each week. Use a crock pot or Instant Pot to do the work for you. When your schedule keeps you away from home, use these to prepare your meal either in the morning (crock pot) or quickly once you get home (Instant Pot). You can find tons of great recipe ideas online! Before the deployment begins, freeze meals that can re-heat easily. I always do this to prepare for a deployment or a new baby, because having pre-made meals in the freezer feels like having gold in the bank! Freeze soup in bags laid flat. When you want to serve it, let it defrost in the fridge overnight (so it won’t be a solid block), then either microwave or heat on the stove top in a pot. You can also make uncooked dishes like lasagna, casseroles, and burritos. Thaw them overnight and bake in the oven to finish the process. Try doing weekly meal prep or using a meal delivery service (as described above) so you are doing less cooking on busy days. Keep a stash of healthy adult food on hand. So if the kids are eating chicken nuggets, you can grab a protein shake, a quick salad, or a frozen salmon burger for yourself. That way, you aren’t cooking two separate meals all the time. When serving a dish the kids may not like, add rolls or grilled cheese sandwiches on the side. We do this whenever I serve soup. The kids may eat more carbs than me, but at least we are all getting some protein and veggies from the soup. If your kids are old enough, get them involved in the meal choices and cooking. 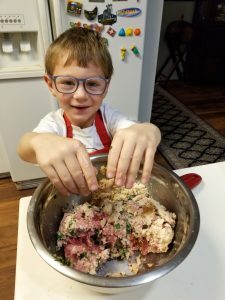 A kids’ cookbook is a great way to get them excited about cooking, and you may appreciate an extra set of hands in the kitchen. We started this when my oldest was 8, and found that the younger siblings were excited to eat anything she prepared, even though they would turn their nose up at the same dish if Mom served it! Go figure. You can read more here about simple meals kids can prepare on their own. If you have been struggling to cook when your service member is away, know that you are not alone! Use these 11 cooking tips to create better routines that will work for your household. And don’t forget that you can download a cooking video training–plus recipes and a shopping list–from the Deployment Masterclass!